A real jump-up on Label Inspection performances is obtained when changing technology from Photoscanners to Machine Vision. � Reason is the much greater amount of Information about the label properties that it results possible to register with a camera. �Amount established correlating a label with hundredths of thousands (or, millions) of individual photo-detectors, rather than just one. � The figure above�shows an example of the equipments’ for final inspection using CCD- or CMOS-technology cameras to inspect the labels’ presence and position. � At left side, a typical example of labelling where Machine Vision becomes nearly unavoidable. amount of CPUs devoted to the task or, availability of GPUs. missing-�or�flagging-labels, detected at >99.5 % with associated false reject ratio < 0.01 %. To detect the entire external sidewall of the container, means to use two CCD- or CMOS- cameras equipped with some megapixels each. � Notoriously, each pixel emulates an elementary (passive-only, no light source) analog photoscanner, whose dynamical range following its model ranges today (4096 - 65535) grey levels. ��By these digits, millions of individual analog photo detectors, and the fact that from each one we are capable to discriminate thousands of grey levels, it is easy to infer why the performances jump-up from the mere presence or absence of a label detectable with a single photoscanner, to positions whose accuracy level rounds 0.1 mm. 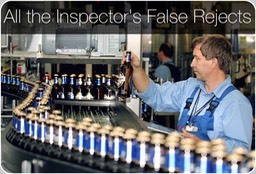 What is a�“good Label inspection” ? As we saw with�plenty of details elsewhere in this web site, as an example we’ll try to determine if a bottle is labelled by mean of a system like a camera, including millions of Pixels. � Pixels accumulate one-by-one the photons reflected by the sidewall, neck and closure of the bottle. � Later discharging the potential accumulated to an A/D converter whose outfeed is sequentially read by following circuits to deduce what to a level of illumination has been subjected each individual pixel during the limited exposure Time. �[There are particularly fast Electronic Inspectors, adopted to inspect plastic empty bottles, having the exposure Time of the Pixels in their cameras forcedly limited to tens of microseconds…] � �Whatever physical system, label included, is�represented by its wave function or state vectors. � �The physical meaning of the state vector becomes apparent when making a measurement. � Then the state of the system assumes one of the eigenstates, with probability given by the Born rule, and the result of the measurement is the corresponding eigenvalue. Interaction between the systems such that the Information in the marginal distribution of the object inspected is never decreased.��In a probability distribution deriving by two random�variables, we remember that�marginal distribution�is where we are only interested in one of them. � Otherwise,�we’d have forced a reduction in the sample�space of one of the random variables and then, we could not have any more�repeatability�of the following measurements. � As an example, this should be the case if to interact with the Label�we’d erroneously try to use a beam of high energy neutrons, rather than strobo flashers’ or LED-matrices's low energy photons. � The neutrons should modify the molecular structure of the Label, modifying its eigenstates and then the eigenvalues we expected to derive by the measurement.